If this is your first visit to our site, we encourage you to look around and sign up to join our professional learning community. We are a vibrant group of educators who care about STEM teaching and learning together for the benefit of our students. We produce high quality engaging workshops in the New York City area and hope you will join us. If you are already a friend of STEMteachersNYC then welcome to our newly redesigned website. STEMteachersNYC is approaching its fifth year of existence, and it has been an extraordinary ride from the beginning in the spring of 2011. As the story goes, five of us (Nate Finney, Mark Schober, Andrew Stillman, Seth Guinals-Kupperman, and I) got together in the Amsterdam Restaurant near Teachers College at Columbia University, and decided that we were going to do something about what we found to be a dearth of support for physics teachers. We collaborated in the writing of a letter announcing that we intended to form a physics teacher support group, and I sent it out via email to many science teachers, including a list that I had compiled in the course of chairing the Science Education Section of the New York Academy of Sciences. We asked anyone interested to show up on a Saturday morning at Teachers College, where I was on the faculty at the time, teaching physics to prospective teachers. 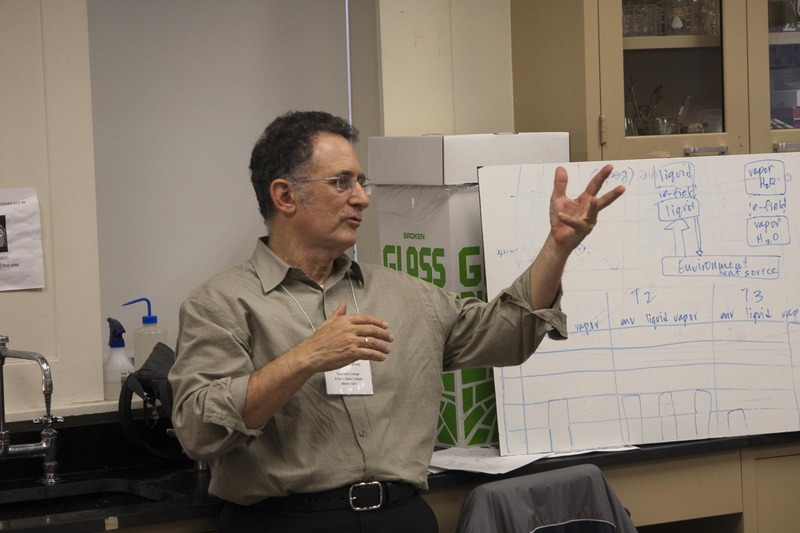 About 25 enthusiastic physics teachers showed up, and a discussion quickly began about a variety of interesting topics related to the content and pedagogy involved in teaching physics. I picked up some chalk and started writing down the topics as they entered the conversation. Pretty soon we had a list of 8 or 10 topics. I asked for volunteers to lead a discussion or a workshop on each of the topics. There were many volunteers, so I wrote down the names of the volunteers next to each of the topics. Then starting from the top of the list, I wrote down the names of the upcoming months, starting with Sept, and all the way through the academic year. That was our first schedule of workshops; we had Mark Schober getting everyone involved in doing and interpreting an experiment on constant velocity, and, later, an experiment using a neat apparatus that slowed down the acceleration of gravity so that students could study it using simply a metronome counting seconds. There were many other excellent workshops, and the amazing thing to me and the leaders was how active and engaged all of the participants were. It made the process of producing the workshops very worthwhile when we could look forward to such quick uptake and such contagious enthusiasm at every session. Fast-forward to today and a great many workshops later and we can now boast a membership approaching 400 and a global community of teachers devoted to leading and learning together. STEMteachersNYC: For Teachers, By Teachers, About Teaching.